As I started to note last night when the story was breaking (I was writing about Caroline Flint), the papers are full of a second memo held by Hazel Blears which reveals that there have been talks of featuring Gordon Brown in an 'Apprentice' style TV programme for wannabe politicians. This had the potential to make him 'more popular than Alan Sugar', according to memo. They have a long way to go. By public Vote, of 84% to 16%, Gordon Brown has become the first sitting PM not to appear in Madame Tussauds for over 150 years. 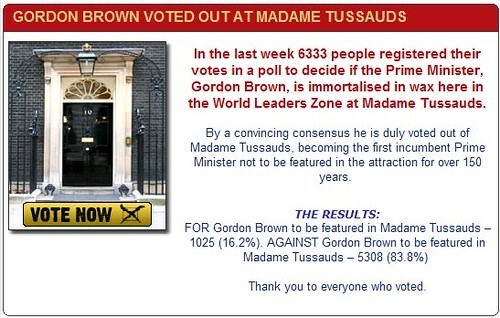 In the last week 6333 people registered their votes in a poll to decide if the Prime Minister, Gordon Brown, is immortalised in wax here in the World Leaders Zone at Madame Tussauds. By a convincing consensus he is duly voted out of Madame Tussauds, becoming the first incumbent Prime Minister not to be featured in the attraction for over 150 years.